This document corrects and replaces the press release that was sent October 5th at 2:04 PM ET. In its 14th year, the Coast Capital Savings Charity Golf Tournament reached a major milestone -- as their total contribution to mental health research hit the $2 million mark. Always a sell-out, the tournament benefits VGH & UBC Hospital Foundation and supports one part of Coast Capital Savings' community promise to help build healthy minds by combating depression and other forms of mental illness. Coast Capital Savings president and CEO Don Coulter said the credit union's dedication to addressing mental health challenges faced by British Columbians stems from both a moral and business imperative. "The silent suffering and stigma often associated with mental illness has touched many of us, either through our own experiences, or with our friends and families," Coulter said. "Raising funds for research and treatment is our way to translate our caring into action." "In addition to the personal toll, we know that mental illness carries significant business and economic costs -- statistics suggest up to $51 billion annually in Canada -- and we hope the funds raised through the Coast Capital Savings Charity Golf Tournament will advance the important work being done by researchers, which will benefit both individuals and businesses." The funds raised through the Coast Capital Savings Charity Golf Tournament over the years have gone to support mental health research at the University of British Columbia. Dr. William Honer, head of psychiatry at UBC and director of the university's Institute of Mental Health, said public funding is helping researchers make strides in mental health intervention and care. "The outstanding success of the Coast Capital Savings Charity Golf Tournament supports clinical research at the UBC and VGH Hospital sites," Dr. Honer says. "The goals are the "three i's": to innovate, incubate, and then integrate advances in the care of mental illness to improve the health of our patients, and create value for the health care system. Carrying this out needs the help of tremendous donor groups like Coast Capital." Wayne Berg, Coast Capital's Chief Commercial Officer and campaign chair for the 2015 tournament, thanked everyone -- individuals and businesses -- who participated in this year's event held at Surrey's Northview Golf and Country Club. "Several businesses have made significant contributions to this fundraising effort since Coast Capital Savings launched the tournament more than a decade ago and it's great to see such leadership from the business community," Berg said. "The success of this year's event owes in large part to the valuable support of platinum sponsors: CRI Canada, Desjardins Card Services, IDC Worldsource, Landcor Data Corp and SEI investments. It's their leadership that has taken us over $2 million this year." 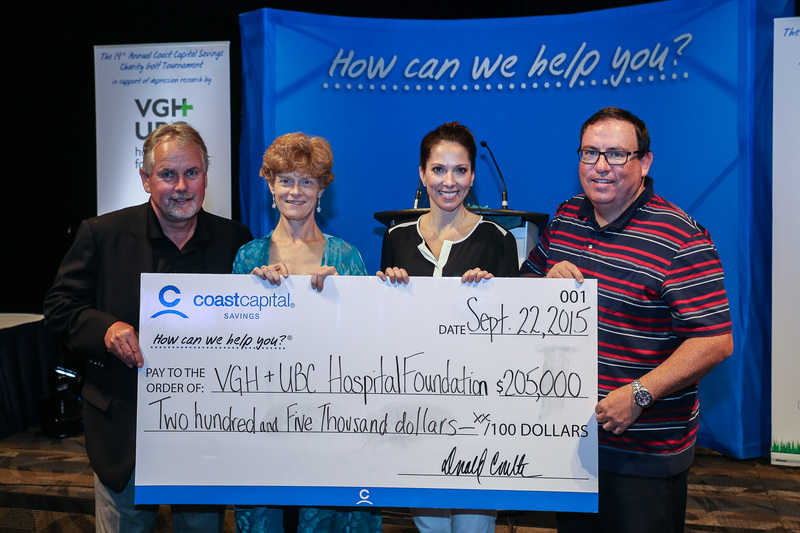 Barbara Grantham, president and CEO of VGH & UBC Hospital Foundation, recognized Coast Capital's longstanding support for the Foundation. "Coast Capital Savings has demonstrated exceptional leadership in the community by creating awareness about mental health and supporting path-finding research that will continue to have a positive impact on individuals and families affected by mental illness," Barbara Grantham says. "We are grateful for Coast Capital Savings' longstanding commitment to advancing patient care and research through our hospitals." Coast Capital Savings is Canada's second largest credit union, owned by its 522,000 members. It has 50 branches in the Metro Vancouver, Fraser Valley and Vancouver Island regions of British Columbia and has exciting plans to grow. Product innovations include Canada's first free chequing account from a full-service financial institution. Coast Capital offers one of Canada's 10 Most Admired Corporate Cultures™ and was named one of 2014's BC Top Employers. It is a member of Canada's Best Managed Companies Platinum Club and an Imagine Canada Caring Company. To learn more, visit www.coastcapitalsavings.com. 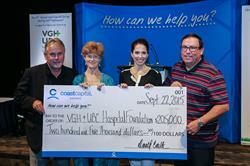 Coast Capital Savings Chief Executive Officer Don Coulter (far right) and Coast Capital Chief Commercial Officer Wayne Berg (far left) along with event MC Kate Gajdosik (second from right) present VGH & UBC Hospital Foundation President and CEO Barbara Grantham (second from left) with the proceeds from the 2015 Coast Capital Savings Charity Golf Tournament. This contribution took the total funds raised for this cause to over $2 million.